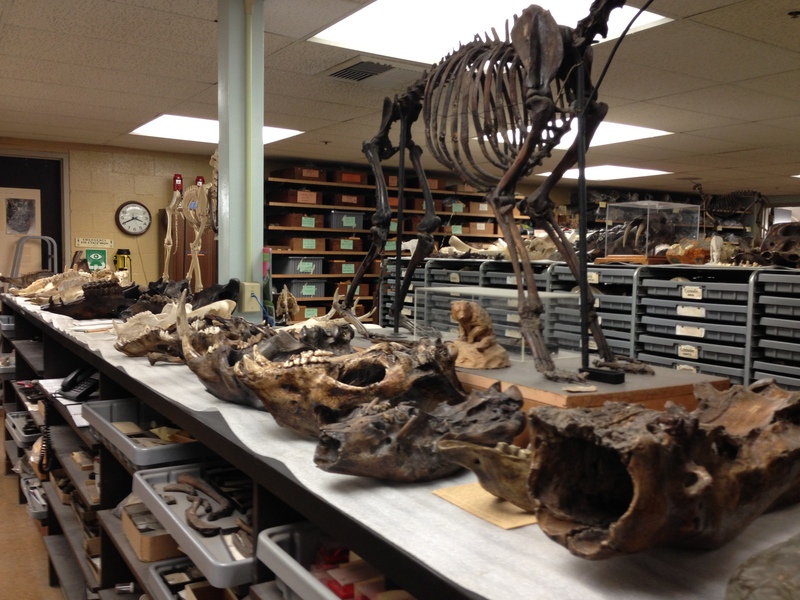 The SciFri staff visited La Brea Tar Pits, which is celebrating 100 years of excavation. This past August, some of the SciFri staff and I had a chance to visit La Brea, and boy, what a place. It oozes with (smelly) history, and we were lucky to time travel with John M. Harris, Ph.D., the Natural History Museum of Los Angeles County’s director of Vertebrate Studies. The pictures here don’t do La Brea justice, but hopefully they’ll give you an idea of what’s there. Here, John Harris and I are looking at several types of bones from Project 23. The large bones at the back of the deposit are from bison, he says, while the smaller bones at the front are a mixture of dire wolf, coyote, and bird bones. The spaces between the larger bones have revealed a number of lizard, snake, rabbit, rodent, and insect fossils. All of the fossils in this deposit are older than 42,000 years, according to Harris. This is the “Pit 91 excavation site,” which was excavated to recover small fossils—snails, insects, rodents, plants, that sort of thing—that occur in what Harris describes as “the asphaltic matrix surrounding the larger bones.” Excavation is now down to 14 feet below the surface of the ground, according to Harris. The red flag marks a Harlan’s ground sloth pelvis. The blue flag points to a horse radius. Most of the fossils here are about 27,000 years old and help us understand what habitats were around in southern California at the time, says Harris.